Shae at 1-day old with her mom, Charlize. Catelyn pronking at the ripe old age of 2 days! Guapo, Honey’s 2014 cria, romping around. UPDATE 5/28/2014! One more girl! There’s a party goin on right here! UPDATE 5/18-19/2014! We got another two girls! The roof is on fire! UPDATE 5/12/2014! We got a grey boy! The rejoicing turned to revelry. UPDATE 5/11/2014! We got another girl! And the rejoicing continued. UPDATE 5/7/2014! We got a girl! And there was much rejoicing. Well, the 2014 birthing season is upon us and we’ve already got three munchkins on the ground – all boys so far! While we were hoping to get a better male-female ratio than our 2013 batch, which was 7 boys to 3 girls, we’re not having much success on that so far! 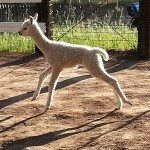 We’re just happy to be having healthy cria! 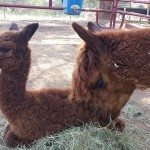 9th cria: Epic Alpacas Darwin’s Shae (Female – Born: 5/28/2014 – Dam: Charlize – Sire: Darwin) Our second girl out of Darwin this Spring, Shae is as strong as can be! She was up and walking within an hour and nursing shortly thereafter. She’s a lovely light fawn/rose grey color with a white face and very soft, fine fleece. Add one more fantastic girl to the list! 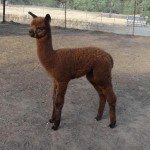 8th cria: Epic Alpacas Lady Catelyn (Female – Born: 5/19/2014 – Dam: Katrina – Sire: Royal Knight) Our second little girl out of Royal Knight this Spring, Catelyn’s a real winner. Bay black in color, and all kinds of bundled, soft fleece. We’re on a roll here for fantastic girls! 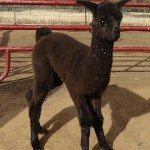 7th cria: Epic Alpacas Darwin’s Morgana (Female – Born: 5/18/2014 – Dam: Merci – Sire: Darwin) Morgana is a great little true black girl out of two full-Chilean black parents! She’s finding her legs more and more each day and growing like a weed! So nice to have a little girl out of Darwin! 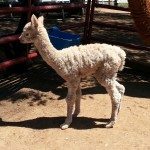 6th cria: Epic Alpacas Diamante en Bruto (Male – Born: 5/12/2014 – Dam: Dulce – Sire: Grey Feather) Diamante was born in the middle of the night, we found him in the morning already nursing and playing with the other cria. He’s a big-boned, strong little medium silver grey boy who looks to be a champ! 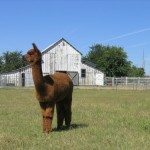 5th cria: Epic Alpacas She-Ra (Female – Born: 5/11/2014 – Dam: Shauna – Sire: Royal Knight) Sweet little She-Ra was born a tender little female at 13.85 lbs and had some trouble getting going, but she’s recovered and going strong. Shauna is an excellent mom and She-Ra will grow strong and beautiful. 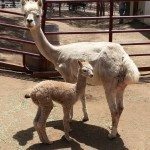 4th cria: Epic Alpacas Isis (Female – Born: 5/7/2014 – Dam: Ivy – Sire: Cinco) Isis is a beautiful girl who was up and walking in minutes, looking like she was a week old alrady! She looks to have a great amount of fleece with very nice crimp to start her life – it’s great to see what our boy Cinco can produce! 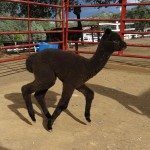 3rd cria: Epic Alpacas Sinbad (Male – Born: 4/28/2014 – Dam: Sahara – Sire: El Toro) Sinbad is a handsome guy and so very sweet and curious. He was born with fleece over an inch long and looks like he’ll follow in his father’s line of being super fleecy! 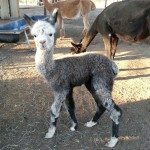 2nd cria: Epic Alpacas Guapo (Male – Born: 4/19/2014 – Dam: Honey – Sire: Grey Feather) Little Guapo, half brother to our great little boy, Gato, was born with the longest legs EVER! He was a gangly spider when born, but he’s got his legs under him and is filling out nicely. 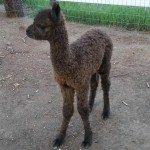 1st cria: Epic Alpacas Callum (Male – Born: 3/20/2014 – Dam: Kiann – Sire: Silver Fox) Callum is a beautiful modern dark silver grey with some amazing crimp! He’s growing into a wonderful boy already with lots of energy and a great disposition.